Zip a Dee Doo Dah, Zip a Dee Dah. My oh, my what a wonderful day…Mister Bluebird’s on my shoulder. It’s the truth, it’s actual, everything is satisfactual. Zip-a-dee-doo-dah, zip-a-dee-ay, wonderful feeling, wonderful day (Song of the South, 1946). A radiant color blue with a warm reddish breast, the male bluebird is as beautiful as he is charming. According to Tom Meyer, a trained bluebird rehabilitator referred to as “Mr. Bluebird” in his hometown of Bedford, NY the male arrives in the northeast in late February, ahead of his mate, and searches for a home worthy to present to her. Once he finds it, he beckons her with joyful chirps to come and approve one of the nest boxes he has selected to raise their family. “He will sit on top of the house fluttering and may show her 3 or 4 spots, just like a real estate agent,” chuckles Meyer. The female, who has lighter blue wings and tail, a brownish throat and breast and grey crown, gets busy creating a nest and promptly lays 4-5 eggs. She diligently incubates her eggs for two weeks. Once hatched, mom and dad share the responsibility of feeding the brood insects. “They kind of alternate, you’ll see the female go in and then the male and as the babies grow, the insects get bigger and bigger,” explains Meyer. It’s the glory and awe of nature at work- a beautiful story of cohabitation, parenting and shared responsibility. Believe it or not, if not for the effort and intervention of Eastern Bluebird loving humans, today, spring would arrive without the beauty and promise of the bluebird. There were several decades spanning the years from 1900-1970 when it was not easy for the kind spirited bluebird to find a natural nesting cavity. Melodee Benoit, administrative assistant to the grounds department and bluebird monitor at the private GlenArbor Golf Club in Bedford, is dedicated to the preservation of the Eastern Bluebird. She explains that urbanization caused the Eastern Bluebird to compete with other cavity nesters for a place to raise their young. The submissive bluebird lost out to more aggressive birds such as The House Sparrow and the European Starling. ”Back in the 70’s, a huge part of increasing the bluebird population was making people aware of the bluebird and their plight and how they weren’t thriving. 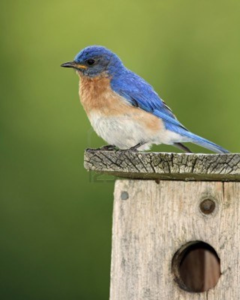 ‘Backyard blue birders’ started putting up bluebird boxes,” explains Benoit. “I’ve put up more than 2,000 bluebird boxes,” Meyer humbly adds. On his list: Bedford friend and neighbor, actress Glen Close. “About 20 years ago, Glen called me to put up some boxes. I remember taking her daughter, Annie on my shoulders so she could see the bluebirds, she said, “Oh, they look like pencil erasers,” chuckles Mayer. In addition, after Christopher Reeve’s horseback riding accident which left him paralyzed from the neck down, Meyer received a call from Reeve’s wife. “Dana asked me to put up a box on their back lawn,” says Meyer. Benoit credits Meyer for making it possible for GlenArbor Golf Club to launch a successful bluebird program. Working in tandem with Benoit, Meyer put up 22 boxes at GlenArbor. “We have an environmental program at the club and the bluebird program is part of that,” explains Benoit. Once a week, Benoit and Meyer travel the course in a golf-cart checking on each bluebird box. The club recently won an award from the North American Bluebird society for environmental stewardship. “They claim that there are more bluebirds coming out of nest boxes that people put up than natural cavities,” says Meyer. As a bluebird rehabilitator, Meyer is often called upon when a bluebird is in danger. Benoit recalls a time when bluebird babies were left alone in a nest. “Usually once a year we have to orphan a bluebird. I can remember calling Tom for help. I put the baby birds in my hands and blew warm air on them. Tom got a heating pad and we put them into a box.” Benoit cared for them until she could add them to a nest box with other bluebirds about the same age. A fascinating trait of the Eastern Bluebird is their willingness to care for another bluebird’s young. “Those parents will then take over as adoptive parents,” explains Benoit. The preservation and recovery of the Eastern Bluebird continues in backyards, parks and golf courses throughout the northeast. “It’s hard not to love this little bird,” says Benoit. “If I could use one word to describe the bluebird, I’d say magical,” adds Meyer. What’s more, the bluebird is the state bird of New York. That’s one more thing to sing about.